Very good. 336 p. Audience: General/trade. book in very good condition, only usual crease down the spine where it has been opened and read. prompt dispatch from our warehouse. Very good. Shelf wear and marking and some folded corners of pages at closed edge, otherwise new and unread. The book was certainly not new, but it was in very good condition. I definitely am satisfied with my order. I'm speechless...I simply enjoyed the book soooooooo much...from start to finish!!!!! This is one of the better contemporary novels I've read. The book offer so much insight into Afghani culture from the 1970s on the eve of the Soviet invasion, and it brings the reader into the minds and hearts of the Afghani immigrant/refugee community of the Bay Area. The twists and turns in the story line progressively shocked me, and caused my mouth to drop (literally). Khaled Hosseini has woven a tale that takes its time being told. Kite Runner is the story of a boy becoming a man in Afghan culture. Amir and Hassan, living in Afghanistan as the novel begins, are raised in the same household, almost as cousins. They are not adversely affected by having no women in the household. The boys grow up together with two fathers and no siblings, with one pair taking responsibility for the domestic chores. Ali and Hassan live their lives in service to Baba and Amir. Indeed, during an attack, both boys huddle with Ali until Baba arrives. I am told that Ali holds Hassan tenderly.1 I suspect that if the boys were raised in America with one working parent, much would have been the same for Amir. The story begins to take on meaning at Amir's thirteenth birthday party, when he throws away a book by Hitler and lovingly receives a blank notebook. Hosseini uses this incident to foreshadow the outcome of Amir's life. Yet, none of the characters in this novel seem to mind that Amir continues to live with his dad even after he comes of age. Nearly everyone in America that I know would have a problem with this. A dependent that turns eighteen should move away from his parents to start his own life. Indeed, the conflict between parents and teens in real life naturally achieves this result most of the time. Attending college can also help young adults to achieve this separation. Thankfully, the author redeems himself and his main character by other means. For Amir, the desired result is achieved with his dad's illness and impending death. Amir's marriage gives him a family in the United States. He is not alone in a foreign land when his dad dies. Amir calls America "a river, roaring along unmindful of the past," a place where a person can be carried off to the ocean, leaving his sins behind him.2 I am not sure if this is meant to mean the country in general, or Amir while living in America. I also find America to be a place where people can move to escape their troubles. I wonder if the huge influx of immigrants begot such culture having had the experience of moving away in the past. We are not centered on family or clan here, instead we work with one group of people for eight hours of the day, commuting an hour or two, and sup briefly with our family and friends before turning in for the night. While living in America, Amir receives a telephone call that troubles him. Rahim Khan, his Dad's former business partner, is sick. He is the man that gave him the blank notebook, the only gift that was well received. The call brought with it suppressed memories of his childhood. During a walk to the park, he seems to be summoning strength to confront something. Will he not stand up for himself once again? He must go to visit his sick friend before he dies. Rahim Khan knows Amir well. Amir respectfully follows the advice given to him by Rahim Khan during the visit. Because he has not backed down this time, Amir has learned that acting justly toward another sometimes requires putting your own safety at risk. Athough Rahim Kahn's and Amir's hearts are healed when they act on Sohrab's behalf, Sohrab needs to achive much healing, still. I am not convinced that Sohrab will recover, and consequently, I am worried that Amir will not be gratified. He will not feel salvation because it is pinned to the result he achieves with the boy. Although Amir's mind accepts that their day at Lake Elizabeth's Park has broken through Sohrab's desolation, he has signed on for far more than he would have had to do if he had been kind to Hassan during their childhood together. On one partially successful day of kite flying, "Sohrab...breathing rapidly through his nose [next to him] the spool roll[ing] in his palms3," Amir thinks "it was only a smile, nothing more. It didn't make everything all right. It didn't make anything all right. Only a smile. A tiny thing. "4 He has an entire life time of days filled with acting to procure the boy's happiness. By now he must realize that his own childhood happiness required effort on the part of others. Amir has achieved no resolution. I find no other solution for Amir's ongoing struggle than for Hosseini to write a sequel. 1.Khaled Hosseini, Kite Runner (New York: Penguin Group Inc., 2005) 35. 2.Khaled Hosseini, Kite Runner (New York: Penguin Group Inc., 2005) 136. 3.Khaled Hosseini, Kite Runner (New York: Penguin Group Inc., 2005) 369. 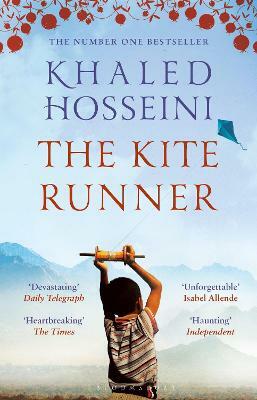 4.Khaled Hosseini, Kite Runner (New York: Penguin Group Inc., 2005) 371. This is a very sad and touching book about a little boy growing up in Afghanistan. It really made me stop and think about racism, how kids struggle with right and wrong, and there's some good history education in it too. Very good book.